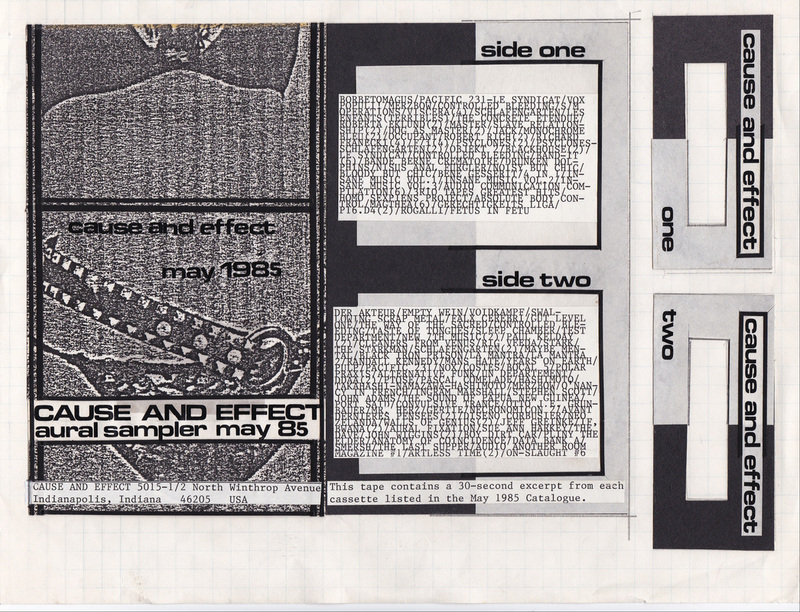 Cause And Effect offered a sampler cassette with every catalog that we published. These sampler tapes contained snippets of 30 seconds from each tape in the catalog so that prospective buyers could get a foretaste of what the cassettes in the catalog sounded like. These samples prefigured the use of listen-before-you-buy streaming samples by 21st century sites such as Amazon. Bear in mind that you are hearing samples that were on a master tape prepared by Debbie Jaffe with extractions from the tape copies that we distributed, so the sounds here are likely third or fourth generation. These aural sampler cassettes are offered as historical documents and are not intended as faithful representations of the original music on the cassette releases themselves. Debbie Jaffe mastered the May 1985 CAE Catalog Aural Sampler cassette on a Radio Shack XR-90 Normal Bias Type I cassette. Debbie Jaffe's original cover layout of the front cover, cassette face labels, and titles/information insert.